What Food Should You Pair With Your Wine? - Australian Wine Tour Co.
Home>Blog>Uncategorized>What Food Should You Pair With Your Wine? To make things a little easier for you next time you’re looking for the perfect bottle to accompany your dinner, we take a look at how food and wine pairings work, plus a few fool-proof pairings that are bound to liven your palate. Wine flavours are derived from a few specific components, including sugar, acid, fruit, tannins, and of course alcohol. Likewise, most foods also feature specific flavour components, such as fat, acid, salt, sugar, and bitterness. For a truly sensuous taste experience, select food and wine pairings that feature complementary components and textures, as well as similar richness levels. Another approach is to select a wine that has contrasting flavour components to the food. For example, you can cut through the fat in a rich creamy pasta by savouring a glass of a crisp, dry, unoaked white wine. However, if you wanted to enhance the rich creamy flavours of the pasta, you might choose a big ripe, soft Chardonnay or Roussanne/Marsanne blend. When pairing food with white or red wine, there are six elements to consider; fattiness, acidity, saltiness, sweetness, bitterness and texture. How each of these characteristics mingles in both the food and wine will determine how enjoyable the pairing is. A lot of our favourite foods contain fat, but wine doesn’t. So, when matching a wine with fatty foods, such as meat and dairy-based foods, try to balance the fat from the food with the acid in the wine. For instance, a prime cut of steak will taste great when paired with a cabernet-based wine, as the beef’s protein and fat softens the wine’s mouth-drying tannins. If you’re looking for a wine to go with an acidic dish, always make sure the wine is at least as acidic as the food, otherwise the wine can end up tasting bland or washed-out. Salt is tricky. It can make Chardonnay taste off, red wine flavourless and high alcohol wines bitter. To combat this, salty foods should always be paired with sweet wines. Food with a light fruity sweetness work well with rich white wines, such as Chardonnay, but if you’re eating a flavoursome, super sweet dessert, your wine should also be sweet. For example, a slightly bitter dark chocolate pairs perfectly with a slightly sweet red wine like Zinfandel. We tend to shy away from bitter foods and bitter wines, especially since a bitter wine is usually the product of unripe grapes. However, if you are going for a bitter flavour combination, bitter food with a bitter wine will likely overwhelm your palate. To counteract the bitterness, opt for something sweeter. When it comes to textures, light food goes with light wines, and heavy food goes with heavy wines – it’s that simple! *If you want to become an expert at pairing your food with the best wine variety, it could be worth brushing up on your white wine and red wine basics. To get you started, here are a few of our favourite combinations. 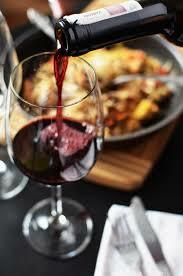 Pinot Noir: Is best when paired with earthy flavours. Think mushrooms and truffles with light-bodied reds that have a savoury depth. Chardonnay: Silky whites, like Chardonnay are guaranteed to be a hit when paired with seafood in rich sauces. Champagne: Dry sparkling wines with a touch of sweetness, such as Spanish Cava are extra refreshing when served with salty foods. Cabernet Sauvignon: Steaks or chops with frizzled herbs will taste even better with California Cabernet of Bordeaux blends, as your palate will be refreshed after each bite of meat. These simple combinations are just the tip of the iceberg when it comes to food and wine pairings. If you want to experience first-hand how some of Australia’s best Yarra Valley wineries pair their mouth-watering dishes with their premium wines, talk to Australian Wine Tour Co about our range of winery tour options.